Seattle area’s Bellevue neighborhood hotel is one of only 50 nationwide properties recognized at this level for its dedication to environmentally sound practices. The Green Key rating is a tremendous honor...It’s a positive reminder to continue our efforts to preserve our environment while continuing to offer comfortable luxury for our guests. Adding to a growing list of green accolades, Hyatt Regency Bellevue announced today that the hotel received the coveted 5 Green Key score from the Green Key Eco-Rating Program, a comprehensive environmental assessment agency. The 732-room Seattle area hotel property earned an average rating of 85 percent across five operational areas -including corporate environmental management, housekeeping, food and beverage operations, conference and meeting facilities and engineering - becoming one of only 50 hotels nationwide to merit the top honor. In commemoration of this prestigious award, Hyatt Regency Bellevue is celebrating with a special offer for guests, who are integral to the continued success of the hotel. Between April 1 and April 14, guests will be able to randomly draw one of five prizes when they mention “five keys” at check in. Prizes will include complimentary standard internet during their stay, complimentary self-parking during their stay, complimentary access to the Regency Club, the property’s exclusive members-only lounge, during their stay, one breakfast buffet for two at the hotel’s newest restaurant, Whisk 425, or one complimentary in-room movie. The Bellevue hotel was recognized for its implementation of energy and water saving technology, committed use of post-consumer recycled materials, constant efforts to source locally, and most impressively, a progressive dedication to its primary use of eco-friendly cleaning products throughout the guestrooms and 70,000 square feet of meeting space. Located 10 miles from downtown Seattle, Hyatt Regency Bellevue has also found its place among local businesses as an innovator in green practices; recently receiving King County Washington’s ‘Best Workplaces for Recycling and Waste Reduction’ in both 2010 and 2011. The achievement of being awarded these accolades, along with the 5 Green Key rating, strongly demonstrates the hotel’s environmental leadership in hospitality, both locally and nationally. Hyatt Regency Bellevue is a AAA four-diamond hotel situated on Seattle’s Eastside, in the heart of downtown Bellevue, Washington. Nestled between Lake Washington and the Cascade Mountain Range, the hotel is part of The Bellevue Collection, the Northwest’s leading shopping, dining and entertainment destination, and offers premier services and amenities to both business and leisure travelers. Recently completing a $185 million expansion and earning a 5 Green Key rating from the Green Key Eco-Rating Program, the hotel offers groups more than 70,000 square feet of flexible state-of-the-art event space – from the third largest ballroom in the state to an intimate 12-person boardroom – 732 luxuriously redesigned guestrooms, an expansive 7,000-square-foot workout complex and a comfortable, spacious lobby. 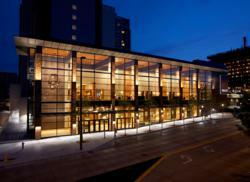 For more information, please visit http://www.hyattregencybellevue.com.